140 mm/50 3rd Year Type2 х 2 pcs. 180 Degree Turn Time24 sec. Initial AP Shell Velocity850 m./s. 127 mm/40 Type89 A11 х 2 pcs. 533 mm Twin2 х 2 pcs. Katori — Japanese promo premium Tier III cruiser. A training cruiser of special construction with marginal armor protection and rather low speed. Despite her modest dimensions, she carried onboard aircraft equipment and torpedo armament. The cruiser's main guns were augmented with dual-purpose guns and automatic AA guns. 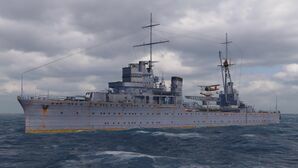 Katori is a Tier III premium Japanese cruiser which many Beta testers may remember as the original Tier I of the Japanese tech tree prior to the introduction of Hashidate. In addition to being moved up two tiers, she gains her Catapult Fighter ( ) and torpedo tubes which were missing from her old Tier I configuration. She is unique in that she is the only Tier III ship in the game capable of equipping a Catapult Fighter, allowing her to see over islands, spot torpedoes well in advance and annoy any aircraft carriers she encounters. Her main battery guns are the standard Japanese 140mm barrels, mounted in two twin turrets (like Yubari) instead of single mounts (like Tenryu and Kuma). Katori can equip Aiming Systems Modification 0 ( ) for increased accuracy. Her torpedo tubes have extremely wide firing angles, but she only has one twin launcher per side; while her torpedo mounts reload relatively quickly, they lack the punch to wipe out most ships even if both torpedoes hit home. Katori’s biggest downside is her slow speed, meaning she cannot move anywhere quickly; even some battleships can chase her down. She requires a very patient play style, and isn't for captains who are in a hurry to get where they're going. Has access to the Catapult Fighter ( ) consumable, giving her additional protection from low-tier carrier players and additional ability to spot enemy ships. Best main battery range of any Tier III cruiser (13.5 km). Guns are highly accurate with Aiming Systems Modification 0 ( ) equipped. Respectable health pool for a Tier III cruiser; far more health than her tech tree counterpart Tenryu. Above average anti-aircraft suite for her tier. Can launch torpedoes from both sides with good firing arcs (unique for Japanese cruisers at low tier). Painfully slow, even when compared to battleships. Only the stock configuration South Carolina is slower. Badly outclassed by two of her most common cruiser opponents: St. Louis and Bogatyr. Standard Tier III Japanese torpedoes, but only 2 launched per salvo. As a Premium ship, Katori doesn't have any upgrades to research. Slot 1: Aiming Systems Modification 0 ( ) greatly improves the dispersion of her main battery. Slot 2: Propulsion Modification 1 ( ) since her engine is particularly vulnerable to being disabled. Key skills for Katori commanders include Preventative Maintenance at Level 1, Last Stand at Level 2, and Concealment Expert at Level 4. Level 3 offers a few solid options, including Demolition Expert and Vigilance. Given how easily her engine is disabled under fire, Damage Control Party II ( ) is a worthwhile investment. Katori is the lowest tier ship capable of equipping a Catapult Fighter ( ), but it isn't really worth shelling out for the Premium version. As a Premium ship, Katori comes included with Type 9 camouflage that lowers her detection radius, reduces the accuracy of incoming shells, and increases the amount of experience she earns. As this is a premium ship, Katori’s main purpose is to increase retraining speed for captains while allowing the user to enjoy playing the ship with all the commander skills active. Therefore, the following signals are recommended for retraining a captain: Equal Speed Charlie London ( ), Zulu Hotel ( ), and Dragon Flag ( ). As for normal ship purposes, the following signals are recommended: Sierra Mike ( ) due to Katori’s absurdly slow speed, and Victor Lima ( ) to set more fires. India Bravo Terrathree ( ) and Zulu ( ) are not recommended because this is a Tier III ship and is a premium; it will not have a significant bonus to credit earning and the ship repair costs are negligible. A pair of Katori prepare for battle. Katori harasses an enemy Kaiser class battleship. Katori uses its' high gun arcs to fire over an island and hit an enemy Langley class aircraft carrier. Katori fires a broadside of four 140mm guns. Katori at anchor, circa 1940. Ordered in 1937, the Katori-class cruisers were intended to replace the obsolete armored cruisers used for training purposes. These small vessels were designed to ready new recruits for service in the navy aboard larger warships and as a result, featured radically different specifications compared to the Japanese cruisers in service. Unlike many Japanese warships, Katori featured a high beam to length ratio, which gave her great stability at sea. 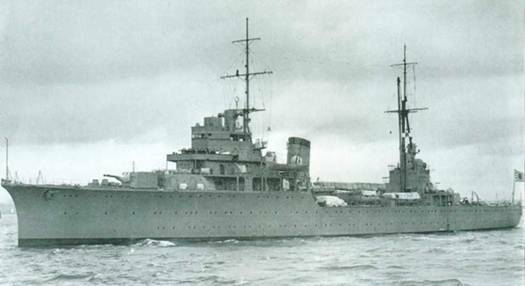 Additionally, Katori and her sister ships were slow for vessels of their size due to the weaker engines fitted on them. These engines were designed for instructional purposes rather than for speed or power. Though designed and built as a training cruiser, Katori would later continue to serve as a flagship for various tasks during World War II. As a result, her anti-aircraft armament greatly increased. By 1944, her original aircraft catapult and torpedo tubes were removed to allow space for additional dual purpose 127mm mounts and numerous 25mm gun mounts. Katori was also fitted with a large amount of depth charges for anti-submarine duty. Katori entered service in early 1940. Assigned to special service duties, she was made flagship of the Sixth Fleet — Japan’s submarine service — in November 1941, and arrived at Truk harbor on the 30th of that month. Katori continued to serve as the flagship and administrative center for the Sixth Fleet from November 1941 to February 1944, and during that time alternated basing between Kwajalein, Truk, and Yokosuka. In mid-February 1944, the US Task Force 58 arrived off Truk with the goal of reducing the airfields and attacking shipping to eliminate Truk as a base of operations for the Imperial Japanese Navy. Just about or after sunrise on 18 February, Katori, along with destroyers Maikaze and Nowaki as well as minesweeper Shonan Maru No. 15 and armed merchant cruiser Akagi Maru, was attacked by aircraft from TF 58. Katori was torpedoed and Akagi Maru sunk. Just after midday, Katori and her remaining consorts were sighted by Task Group 50.9, comprising battleships Iowa and New Jersey, cruisers Minneapolis and New Orleans, as well as destroyers Bradford and Burns. Maikaze and Shonan Maru were quickly sunk, and Katori was then taken under fire by Iowa. Whether by direct hit or damaging near miss, Katori began to list and sink at an undetermined time after 1300 on 18 February 1944. Numerous survivors were sighted but none picked up by the ships of TG 50.9, which were attempting to overtake and sink Nowaki, the sole surviving ship of the group which fled Truk with Katori. Katori was stricken from the navy list on 31 March 1944. Katori’s camouflage is actually the historical camouflage of the seaplane tender Akitsushima (not in the game). Katori’s overall dark gray paint scheme is missing. Katori at Saiki Bay, Kyushu, 1941. Damaged by American carrier aircraft, Katori burns off of Truk, 18 February 1944. US Office of Naval Intelligence recognition drawing of Katori. This page was last modified on 23 May 2018, at 13:53.